Luckily, caregivers can help make their little one’s first few trips to the dentist positive! Get kids excited about the dentist early, and who knows? Maybe they’ll be begging to visit the dentist every year. The American Academy of Pediatrics (AAP) recommends that caregivers start cleaning baby’s teeth as soon as the first tooth erupts. They suggest wiping the tooth with a piece of clean gauze or damp cloth. Not only does this keep the tooth clean, it provides a sensory experience for baby. They can become used to an object wiping their teeth and know what it feels like to have something near their teeth. As kids get older (toddler age), you can let them pretend to brush their favorite doll or stuffed animal’s teeth, or they can pretend to brush your teeth to prepare them for brushing their own teeth in the future! The AAP recommends that children have their first dental appointment within six months of their first tooth coming in or at 12 months of age, whichever happens first. Taking them to the dentist at this young age not only lets the dentist assess the condition of the tooth or teeth, it also gets baby used to dental appointments early on and makes seeing the dentist a part of their routine. Provide kids with lots of love and support when they visit the dentist, especially during their first appointment. Hold baby to comfort them if they get upset, provide encouraging and soothing words to nervous toddlers. For extra support, have baby or toddler bring a comfort toy, like their favorite stuffed animal to the exam. With toddlers, the more you can turn activities or chores into games, the better. Play car games that promote communication skills to and from the appointment. Play “I Spy” or other fun games in the waiting room. Let your toddler bring their favorite toy with them to hug if they get nervous or to show the dentist during the appointment. See if your dentist gives a “report card” or some type of reward to children after the appointment. 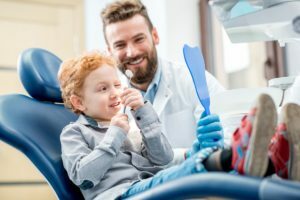 Having your own report card made in advance or having some type of reward or treat children can receive after a trip to the dentist can make the appointment more fun too! Infants won’t understand as much about trips to the dentist as toddlers will. As kids get older, get them interested in their teeth and dental health by explaining to them how important it is to consistently brush their teeth and see the dentist. Read books about teeth or trips to the dentist, pretend-play dentist with your child, or let them practice brushing teeth on you or a stuffed animal or toy to help spark curiosity and excitement about their upcoming appointment. If they’re excited about it, they’re more likely to have a good experience. Kids mimic behavior. If they see you dreading a visit to the dentist or talk about it negatively, they may pick up on that. If you frame it as a good experience, your child is more likely to do so as well! Click here to see all our blog posts. Make teeth brushing fun for your little one! No parent wants to see their child upset. Try these tips to comfort a nervous or fearful child.